If you have the chance, pick up a copy of today’s NY Post. In it, EQUAL MEANS EQUAL urges Virginia and Arizona to vote on the ERA and explains why this is the last necessary step to achieving full legal equality under the law for all Americans. 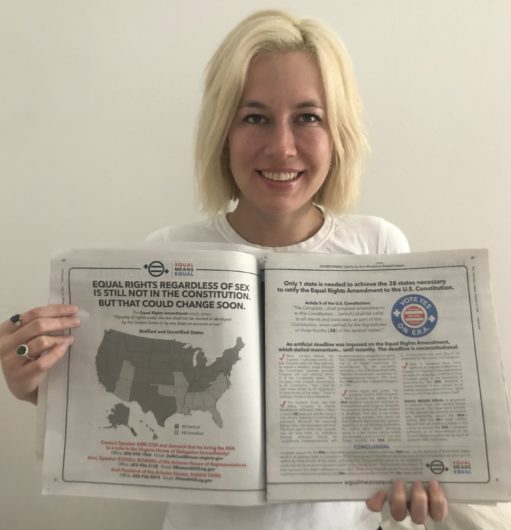 Hundreds of thousands of people will read that ad today, increasing pressure on Virginia, and other unratified states, to do the right thing by women. EME's Natalie White holds up our ad, A special thank you to Elizabeth Jagger, Jerry Murdoch, and the entire Murdoch family. We have come so far! We don’t have very far to go at all. One more state. One more vote. In Virginia. This next week. There is a last rally planned for Virginia on Valentine’s Day. If you can come join us in Richmond, and show women some love, please do. We must succeed on getting ERA on the floor by the end of next week or we are done in this state this year. VAratifyERA campaign will host a “Lead Virginia Forward, One State to 38” rally next Thursday, February 14th, on the steps of the Virginia State Capitol (1000 Bank Street, Richmond) at 10:30 AM. We encourage all EME Supporters to go to the rally.